When I read this recipe from Cooks Country, I was intrigued. The idea of using pureed dates to replace some of the fat in the recipe is not a new concept, but interesting since I have used pureed prunes in the past in baking to reduce the fat, but never dates. The idea of browning the butter in order to "mask" the flavor of the dates, was brilliant. I know browned butter is not a new concept, but, I surely never thought of using it to disguise another flavor. And it really does mask the flavors of the dates, just as they claim it would. So ok, you're probably wondering how why I am calling them "sort of healthy". Well, besides the dates, I used some whole wheat pastry flour, ground flax seeds and walnuts. Flax seeds are a very rich source of alpha-linolenic acid (ALA), a plant source of omega-3 fatty acids. There are many benefits that research has shown flax seeds may provide; including, improve heart health, regulate blood pressure, improve the immune system, help rheumatoid arthritis, reduce hot flashes, and fight breast and colon cancers. Walnuts are also a good source of omega-3. Plus, I reduced the sugar in the recipe! And less refined sugar in our diets is always a good thing. Is that healthy enough for you? Hehe! Adjust an oven rack to the middle position and heat the oven to 325 degrees F. Line 2 large baking sheets with parchment paper. Bring the water and dates to a boil in a small saucepan over medium-high heat. Simmer until the dates are tender and most of the water has evaporated, about 20 minutes. Using a rubber spatula, work the dates through a fine-mesh strainer into a medium bowl. Scrape the dates remaining in the strainer into the bowl (you should have about 1/4 cup puree. If you are short a little, you can add an equal amount of canola oil to replace the amount of date puree you are missing). Cook the butter in a small stainless steel saucepan over medium heat until nutty brown, stirring frequently, about 4 minutes. Watch carefully so it doesn't burn. The butter should be a golden nutty brown color with dark brown bits at the bottom of the pan. (If it turns completely dark brown it is burnt; discard and start again.) Let cool. Whisk the flours, baking soda, ground flax seeds and salt together in a medium bowl. In a large bowl, beat the melted butter, brown sugar, and date puree together with an electric mixer on medium speed until smooth, 1 to 2 minutes. Beat in the egg and vanilla until combined. Reserve 2 tablespoons of the chocolate chips, then mix in the remaining chips and walnuts. Working with 2 tablespoons of dough at a time, roll the dough into balls, tear the balls in half, and press back together with the torn side up. Lay the cookies jagged side up on the pre­pared baking sheets, spaced about 2 inches apart. Press the remaining 2 tablespoons of chips evenly over the cookies. Bake the cookies until the edges are set and beginning to brown but the centers are still soft and puffy, 15 to 20 minutes, rotating the sheet halfway through baking. 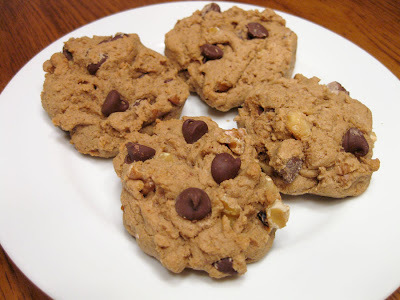 Do not under bake, these cookies will remain chewy when cooked to a light golden brown. Interesting recipe. I've never seen pureed dates in a chocolate chip cookie recipe. That's kind of brilliant. See, these just sound really flavorful to me. I wouldn't mind the low butter amount at all. Hey! It's national date nut bread day. Thought I'd share that. Oh! I never had chocolate chip cookies with date...must taste yummie!